How Many Days Before President Pence? The news of the forced resignation of National Security Adviser Michael Flynn, due to the scandal that he, as a private citizen, spoke to the Russian ambassador in December after President Barack Obama issued sanctions on Russia for their aggressive behavior, has rocked the Donald Trump Presidency. Trump, already under fire by many conservatives and Republicans for his “bromance” with Russian President Vladimir Putin, is suspect as to his loyalty to traditional American foreign policy, as a result of him having hired Flynn in the first place. Critics had observed that Flynn seemed unreliable and had poor judgment. Former colleagues darkly joked that there were “Flynn facts,” a reference to his penchant for making up stuff. Flynn had also been criticized for being too close to Putin. At the Republican convention he joined in a chorus of “Lock her up!” a reference to Hillary Clinton. Many foreign policy professionals are shaking their head at Trump’s inappropriate behavior and language every time he speaks in public, or issues a Twitter comment, and his instability and recklessness. His having a security meeting over the North Korean missile test in public space at dinner in full vision of other guests is a sign of his failure to act responsibly. His abrupt ending of a phone call to the Australian Prime Minister, our loyal ally in four wars in the past hundred years, is alarming. His inconsistent message in his dealings with China, first indicating he accepted the idea of two Chinas, and then backing off under pressure, is disturbing. His inconsistency on the two-state solution in the Middle East is a major problem, as is his seeming lack of respect for Germany’s Chancellor Angela Merkel, and lack of strong support for NATO. The fact that Vice President Mike Pence played a major role in pushing Flynn out is a sign that Pence is already asserting himself with Trump, and it seems clear that Pence will not stand by and allow our foreign policy to be damaged, or our national security to be endangered. The American people, ultimately, would not expect anything less. Mike Pence is an establishment Republican, with 12 years in the House of Representatives, where he served in a leadership position as Republican Conference Chairman in his last four years in the House before running for Governor of Indiana. Pence is a no-nonsense, hard-nosed Republican whose strong Christian convictions have shaped his politics, including his stands on women’s issues, gay and lesbian matters, and his refusal to accept the concept of global warming. His stands on these and other issues alienated moderate Republicans in his state. His poll numbers were low when Donald Trump picked him for vice president. Many doubted Pence would have been able to win a second term as governor. Pence knows how to play “hard ball” and it is clear by his demeanor and body language that he is often uncomfortable with Trump’s freewheeling and careless behavior. An investigation into the Flynn matter will develop, with Speaker of the House Paul Ryan and Senate Majority Leader Mitch McConnell promoting it. Additionally, Senators John Cornyn of Texas, Roy Blunt of Missouri, Lindsey Graham of South Carolina, and John McCain of Arizona all are pushing for hearings. As the FBI investigates this situation further, which would be expected to occur as a normal procedure after such a high level and immediate scandal, the earliest ever in any Presidential term (25 days), there will be calls for Trump to resign or be impeached. Pence will have the difficult job of defending Trump in public appearances, but can be expected to work behind the scenes to insure that Trump stabilizes his utterances and actions, particularly on foreign policy and national security matters. Pence faces now a situation that has some similarity to Gerald Ford under Richard Nixon during a time of trouble and controversy, and the possibility of future Congressional action against Donald Trump if his mental behavior continues to disturb the top leadership of the Republican Party and the foreign policy establishment. As this author wrote on January 22 on History News Network, Pence could, even if Trump vehemently opposed it, invoke the 25th Amendment, Section 4 with the approval of a majority of the cabinet, which would make Pence “Acting President.” Some might call it a “palace coup” but Pence could make a convincing case that it is too risky to leave Trump in power. 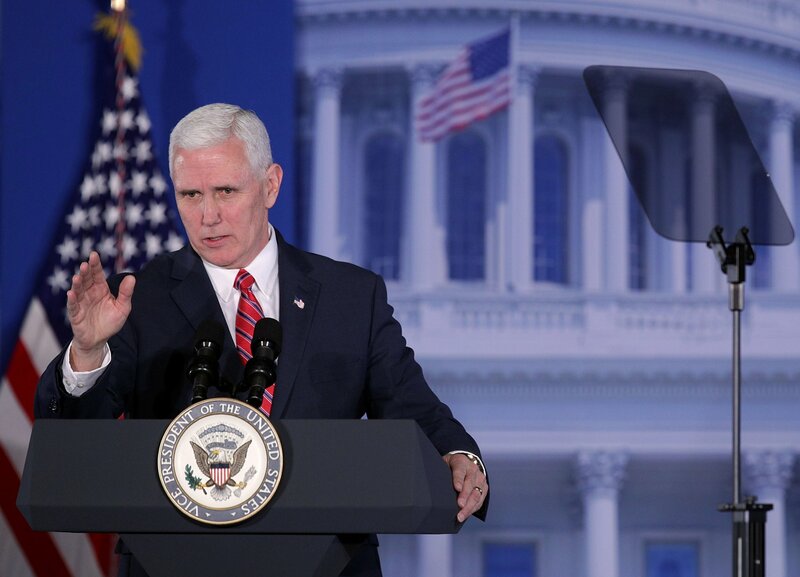 Pence faces a great burden, and whether one agrees with his own agenda on domestic and foreign policy, it seems clear that the Vice President would do what he feels compelled to do if the situation further deteriorates. One would imagine that if such a scenario occurred, that Donald Trump would resign, as Richard Nixon did in 1974 after the House Judiciary Committee approved his impeachment. But with an unhinged person such as Trump, who can say what would happen in such a circumstance? In any case, it seems likely that Donald Trump will be leaving the Presidency at some point, likely between the 31 days of William Henry Harrison in 1841 (dying of pneumonia) and the 199 days of James A. Garfield in 1881 (dying of an assassin’s bullet after 79 days of terrible suffering and medical malpractice). At the most, it certainly seems likely, even if dragged out, that Trump will not last 16 months and 5 days, as occurred with Zachary Taylor in 1850 (dying of a digestive ailment). The Pence Presidency seems inevitable. Neil Buchanan: Better Trump Drunk Than Pence Sober?